Prototype: 9 passenger cars. Of them 3 DB type Bpmz 291 open seating cars. 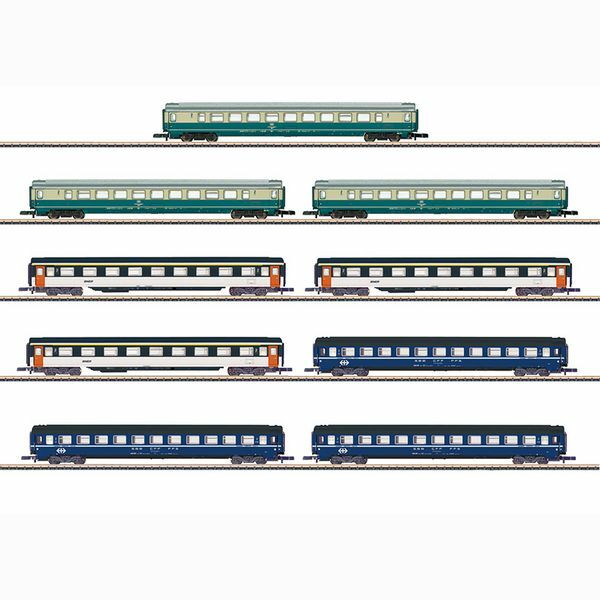 3 SNCF type B9u Eurofima compartment cars and 3 SBB type Bcm Eurofima slumber cars. All of the cars look as they did from 1979-1982. Model: All of the cars have extensive paint schemes and lettering. Each of the cars has its own car number. The cars have close coupler hooks and black nickel-plated metal wheels. The cars are individually packaged in the sales display. Length over the buffers per car 120 mm / 4-3/4".